Try not to throw up but looks like humanity is working on trying to find every possible solution on producing electricity. Researchers from the Institute of Bioengineering and Nanotechnolgy in Singapore have developed a battery that is powered by, yes, urine! The team created the credit card-size power pack as a disposable source for medical test kits. Team leader Ki Bang Lee explains that the urine powered battery is a chip which is activated by biofluids such as urine. He said that presently the cells produce 1.5 volts for 90 minutes which is quite good for the start. 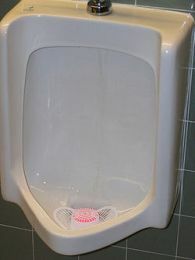 Urine contains many ions for a chemical reaction to occur. The team of researchers says that they are aiming to build cells that can power laptop computers, mp3 players, televisions and even cars! They aim at doing so by connecting multiple battery cells together. They claim to have already started working on the battery to power a mobile phone. It sure will stink if the battery cracks and leaks – Yikes! If this technology were to take off in a grand scale this would be much cleaner and safer than Lithium ion batteries. Next The Google Bouncy Logo!